President Emmerson Mnangagwa is reportedly in Angola to meet President Joao Lourenco in Luanda today. Both presidents are relatively new in office, having started their tenures late 2017. They also share similar circumstances of having served as Defence ministers under presidents who wanted to thwart their ambitions to move to the helm of party and government. This becomes Mnangagwa's second official State visit since taking over the reigns of power from long-time ex-president Robert Mugabe last November. Mnangagwa, largely seen as a reformist, is paying courtesy calls on Sadc leaders who have since endorsed his administration which assumed power through the help of the military which orchestrated a 'soft coup' that forced Mugabe to resign. Mnangagwa was in South Africa last month and met President Jacob Zuma. Presidential spokesman, George Charamba was quoted saying, "The President is paying courtesy calls on regional Heads of State and Government. We started with South Africa and we are going to Angola tomorrow (today) to do the same. We will go to Namibia on Monday then Zambia and Botswana, among other countries. That is the format. If you have been appointed a President, you must pay courtesy calls on elders in the region." President Lourenco, a former Defence Minister, took over as Angolan President in September last year from Jose Eduardo do Santos who led the oil-rich country for 38 years. Zimbabwe and Angola share bilateral relations in various areas. There has also been constant exchange of notes between the countries' revolutionary parties, Zanu PF and Popular Movement for the Liberation of Angola (MPLA). 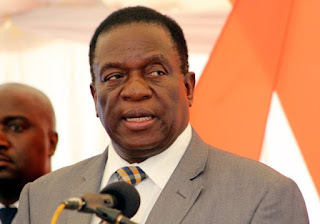 While in SA, Mnangagwa called for dialogue and regular engagements between government, the diaspora and private sector, saying efforts were needed to turnaround the economy. Meanwhile, South Africa and Kenya are expected to conclude several bilateral agreements that will expand and deepen the partnership between the two countries during the first quarter of this year. This was revealed by Kenyan President Uhuru Kenyatta after his meeting with his South African counterpart‚ President Jacob Zuma‚ in Durban on Thursday. Kenyatta‚ who is on his first working visit to South Africa after being re-elected in August last year‚ will also attend the ANC's 106th year celebrations in East London on Saturday 13 January.